After being exposed to the travesty of dolphin slaughtering this past week when I watched The Cove for the first time, I have become even more interested in our fascination with dolphins. The term ‘dolphin’ refers to a diverse assortment of marine mammals. Dolphins have long been loved and thought of as guardians and protectors to humans. To many ancient fishing communities, dolphins following a ship or cruising alongside of a ship is thought to be a good omen of a smooth and safe journey. Many surfers and swimmers tell stories of dolphins coming between them and bull or tiger sharks protecting them. I remember my grandmother (who just passed away this week) telling me on Ocean City trips and trips to Florida that seeing a porpoise in the water was a good sign as it meant no sharks were around. We would head to the shore for a swim, to feed the seagulls or to collect shells and hope to see a dolphin or porpoise in the water. Not to be confused with dolphins, porpoises will generally have shorter snouts and appear darker in color. The term dolphin is not restricted to a single taxonomic class and therefore it is an unspecific term. The groups of toothed whales whose members are often referred to as dolphins include the oceanic dolphins (Delphinidae), river dolphins (Iniidae), and the Indian river dolphins (Platanistidae). Of these groups the oceanic dolphins are by far the most diverse. Dolphins are descendants of terrestrial animals. Two small rear limbs re noticeable in embryos and have been discovered recently on some dolphins. The land ancestor of the dolphin lived about 50 million years ago and looked a little like a wolf. This animal hunted in shallow waters and by and by adapted itself to life in water: the forelegs became flippers, the hindlegs disappeared and the fluke evolved, the fur disappeared and the nostrils moved to the top of the head. A group of dolphins is called a “school” or a “pod”. These pods are usually led by a female dolphin. The dolphins in a family help each other, for example when raising their young. When travelling or hunting, several families might join together to make a larger group, a school of dolphins. There are over 40 types of dolphins – 35 are ocean, 5 are river. There are also some hybrid dolphins like the wolphin. Dolphins are carnivores that east fish & squid mostly. Dolphins breathe using a blow hole. Breathing is not automatic for them, they can choose not to take a breathe. This is how FLIPPER died. Dolphins communicate with whistle-like sounds produced by vibrating connective tissue, similar to the way human vocal cords function. They are highly intelligient with large brains. When dolphins sleep they turn off only 1/2 their brain so they can continue breathing. Dolphins predators are bull shark, tiger shark, dusky shark, great white shark and humans. Dolphins are mammals giving birth to live calves and they nurse their young for up to two years. Dolphins can make a unique signature whistle that may help individual dolphins recognize each other, collaborate and perform several other kinds of communication. You may surprised to know that the dolphin brain is actually much larger than the human brain. Dolphins have two hemispheres just like humans however, theirs are split into four lobes instead of three. The fourth lobe in the dolphin’s brain actually hosts all of the senses, whereas in a human, the senses are split. Some believe that having all of the senses in one lobe allow the dolphin to make immediate and often complicated judgments that are well beyond the scope of a human ability. 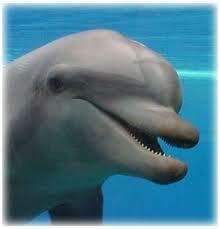 Dolphins use echolocation to find fish to eat. Dolphins can live to be 50 years old. Dolphins are well-known for their agility and playful behavior. Many species will leap out of the water, and spy-hop (rising vertically out of the water to view their surroundings). They can dive to a depth of over 1,000 feet (300 m) and can jump up to 20 feet (6 m) high out of the water. They normally swim at just a few miles per hour, but they can achieve speeds up to 25 miles per hour (40 Km/h). All species of dolphin are protected under CITES. The snubfin dolphin, amazon River dolphin, Indo-pacific humpbacked dolphin and the Atlantic humpbacked dolphin are prohibited commercial trade. All other dolphins are allowed to be commercially traded as long as it does not endanger a species’ survival. This entry was posted in Creature Feature, Home page and tagged amazon river dolphin, and the Indian river dolphins, atlantic hote sided dolphin, black dolphin, boto, bottlenose, ceanic dolphins, chinese river dolphin, commerson's dolphin, Delphinidae, dolphin, dolphin pod, dusky, hector, horglass dolphin, irrawaddy, irrawady, killer whale, melonhead dolphin, orca, Peale's dolphin, Platanistidae, rissos, river dolphin, river dolphins (Iniidae), spotted, type sof dolphin, types of dolphin, white beaked dolphin, white striped. Bookmark the permalink.